Three short days ago, a coworker announced that John Hodgman and Jonathan Coulton would be giving a presentation, or a talk, or something later that afternoon. As a fan of both Hodgman and Coulton, my mind was pretty much decided as soon as I heard about it — I had to go. 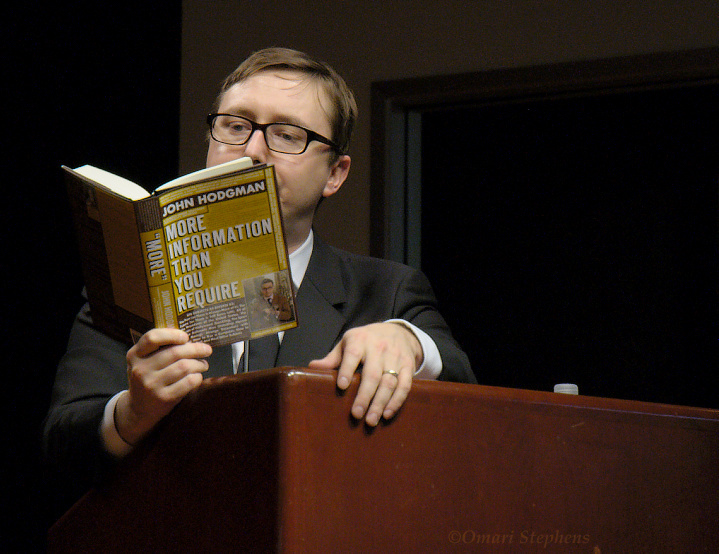 So, after some more poking about, I found that the event was actually a small stop on Hodgman's book tour for his new book, More Information Than You Require, which he bills as "A Further Compendium Of Complete World Knowledge In 'The Areas Of My Expertise'." Comically, the new book follows his prior publication, The Areas Of My Expertise, which he calls "An Almanac Of Complete World Knowledge Compiled With Instructive Annotation And Arranged In Useful Order By Me, John Hodgman." Much to my surprise, when I arrived, there was little room left to stand, let alone sit. I walked up the aisle, managed to find an empty seat in the second row, and then just sat down at the front of the aisle instead. 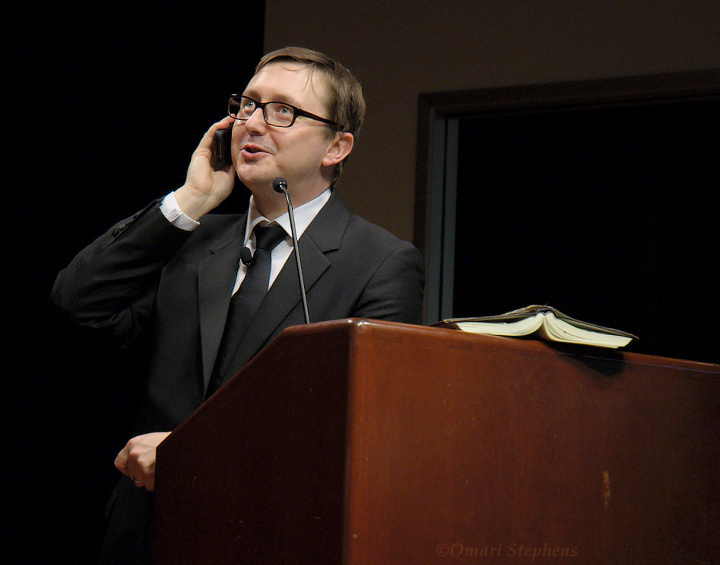 The talk started off with a song by Coulton about the new book, and then progressed into an increasingly-comical dialog between Coulton and Hodgman. And that was just the start: the entire event was hilarious beyond my wildest expectations. It was sort of like a backwards rollercoaster — we didn't know when the pair were going to throw various twists and turns at us, but when they did, the audience would nearly-simultaneously burst out into fits of raucous laughter. 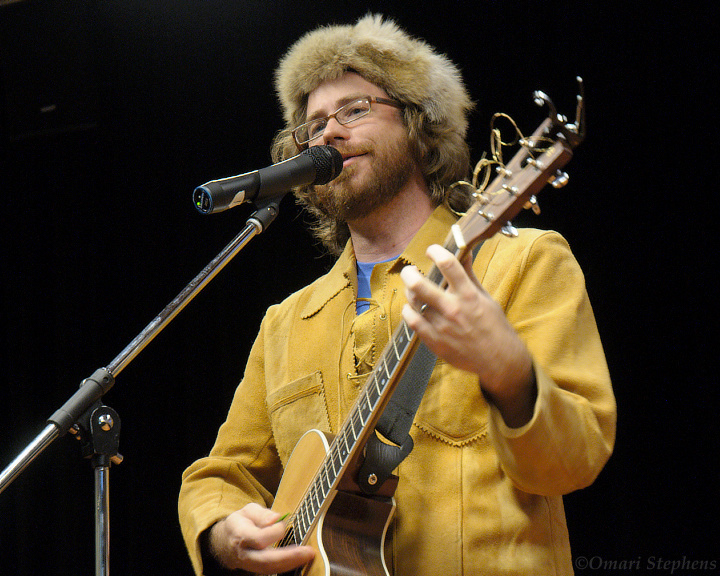 I think this is a nice snapshot of Jonathan Coulton, both as a performer and as a person. During the beginning of the talk, Hodgman introduced Coulton as his feral mountain-man accompanist from the wilderness of Connecticut, raised by animals and only years later introduced into human culture and taught to speak English and play the guitar. Coulton's reply was simply, "I'm not feral." All in all, though, Coulton was an amusing mix of seemingly-incongruous attributes: smart water, but pretty simple shoes. 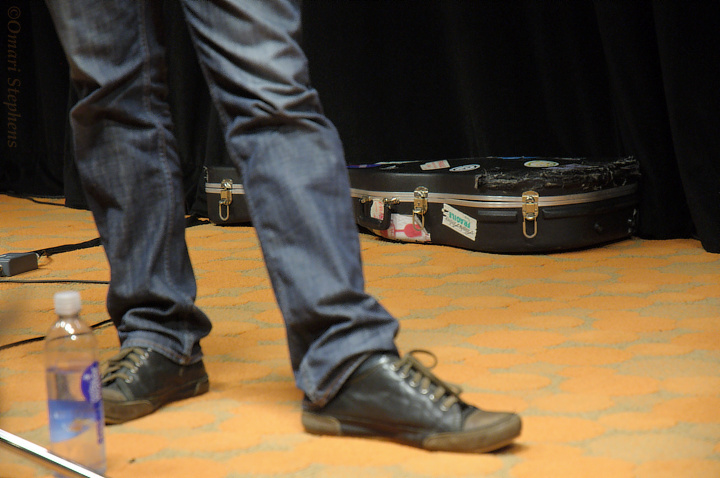 A beat-up guitar case graced with a comparatively pristine Creative Commons sticker. 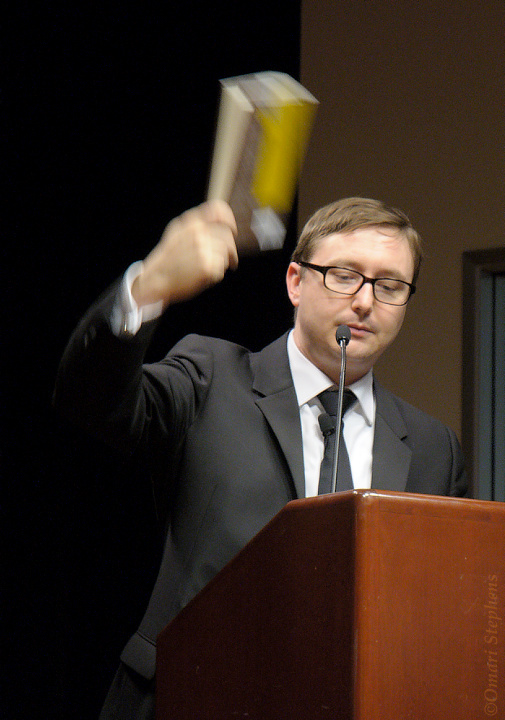 And as John Hodgman pointed out during a serious moment near the end of the talk, despite Coulton's accompanying role during the book tour, Coulton was arguably the more successful of the two, having gained international renown by virtue of doing the vast majority of his business over the Internet. By contrast, Hodgman noted, his book is bound much more tightly to specific geographies by various copyright and licensing laws. 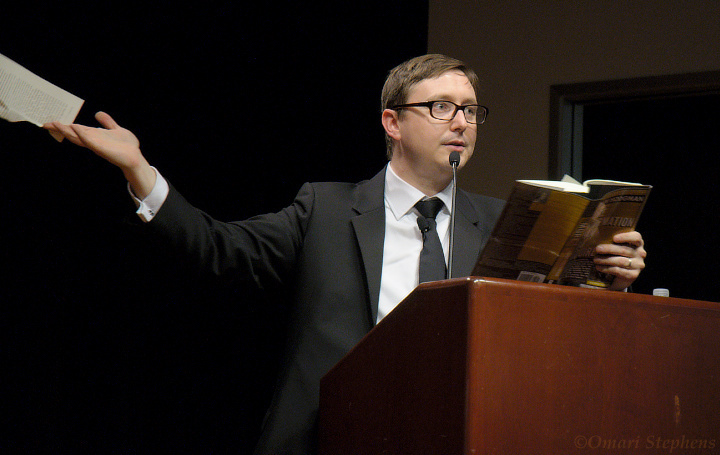 After smacking the book on the lectern a couple times, the talk went on with Hodgman reading various comedic excerpts from the book. At some point, he started comparing his new book to its predecessor. Despite the claims that both were compendia of complete world knowledge, Hodgman explained, there were some faults of the first book which were fixed in More Information Than You Require. After ripping the page from the book, Hodgman slipped it back between the adjacent pages, and returned the book to its newly-chagrined owner. He succeeded to pull his own copy of the book from behind the lectern — a backup copy, he explained — and then launched into a diatribe on what it was like to be a famous minor television personality. And now, a quick aside. I generally shoot without a neckstrap, and so I always keep my camera in my right hand, if not both. Over time, I've learned to use my left hand to make clapping noises when I want to clap. Needless to say, Hodgman did or said something funny, and I started slapping my knee in applause (while simultaneously laughing hysterically). Hodgman noticed this, and saluted me: "Hey there, knee-slapper!" He noted that he had never seen someone actually slap their knee while laughing, and that he half-expected someone to shout "Guffaw!" from the back of the room, a statement which elicited another round of laughter from the room, followed by someone shouting "ROFL!" After moving on, the talk was again interrupted; this time by a ringing cell phone. As the front-row perpetrator (and/or victim) tried to silence the phone, Hodgman simply said "Oh, I'll answer it," then walked over and did just that. He had a surprisingly long discussion with what was apparently the person's dad, explaining that his son wasn't available because "he's watching me give a talk." A little later, the topic of the discussion shifted to Hodgman himself, at which point he coyly asked, "What, you mean you haven't heard of me?" As the talk came to a close, Hodgman noted that, as a result of the aforementioned internationalization mismatch (haha, I know some of you were thinking "impedance"), he and Coulton likely wouldn't continue touring together after the end of this book tour. As a result, he explained, he had learned to accompany himself until he could find another feral mountain-man to do the job. 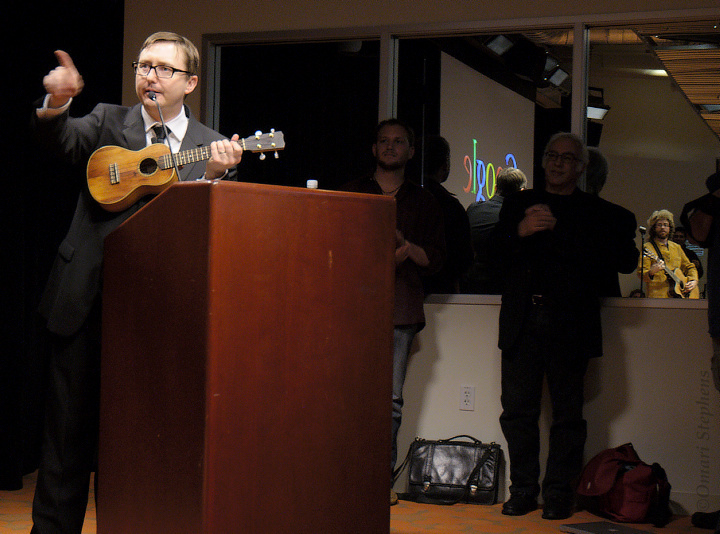 At this point, Hodgman procured a ukulele from behind the lectern, strummed it, and looked menacingly at Coulton, at which point they launched into a duet of a song I recognized, but without any clue as to where I recognize it from. After the duet, Jon Coulton spent a few minutes telling us how to sing the chorus, and then played a much-applauded sing-along version of Re: Your Brains. To finish, Hodgman held the funniest Question and Answer session I've witnessed. He generally paraded around, including a couple treks through the packed seating area, and alternated between hoarding the three question-microphones, tossing them at thankfully-coordinated audience members, and having people shuffle them around to waiting inquisitors. The song is an old one from the 1920's called You Belong To Me. It was used in the Steve Martin movie The Jerk, when Steve and Bernadette Peters' characters sang it as a duet.